Gail Simone, script writer for the upcoming FIRESTORM series, recently chatted with the folks over at Things from Another World (TFAW). They covered BATGIRL, FIRESTORM, the New 52 launch, female comic creators, and more. Below you’ll find one of the Firestorm-related questions in the interview. It’s a great question, but I love Gail’s answer even more. Notice how carefully she crafted her response. On the surface, it seems that she’s answered the question directly. However, if you think about more, she’s really shared some interesting information without actually answering the question. Clever girl. TFAW.com: Are the events of Blackest Night, such as Ronnie killing Jason’s girlfriend, still in their past? Gail Simone: Our Firestorm #1 is their first meeting. Be sure to visit Things from Another World (TFAW) and check out the entire interview! As always, great stuff from Gail! Posted in: Firestorm #09: New 52 v1 (Firestorm Protocols), Firestorm comic vol. IV, Gail Simone. Well, there’s two ways to look at her answer. 1. The conspiracy theorist method: In Firestorm #1, we see a previously undisclosed meeting between Ronnie and Jason at some point in the past. 2. The cynical method: Gail Simone considers herself an ARTEEST who can do no wrong and will write whatever she wants. Thanks for the comments. 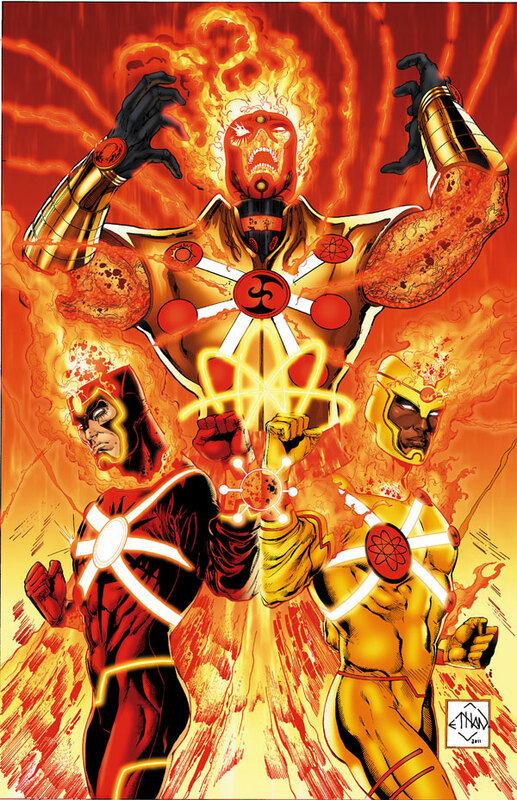 I was leaning more towards the idea that while FIRESTORM #1 is Jason and Ronnie’s first meeting, perhaps Firestorm’s involvement during BLACKEST NIGHT and BRIGHTEST DAY still happened in some way. Just because Blackest night happened doesn’t mean it happened exactly the same at in this universe. Clearly it may NOT have involved some characters. No way Ronnnie died and Jason became Firestorm with all the previous histroy intact not with them bot being in high school and heroes only appearing five years ago. People need to let go of what went before.This is a new DCU. Is anyone reading FlashPoint? I haven’t been, but I kind of assumed it had a time-altering component to it which would explain some of these history wipes or alterations.